When I heard Benefit was launching in New Zealand I was excited to finally get my hands on some of their cult products. What I didn't know was that Benefit also happen to take brows very seriously. Last Thursday I visited the Benefit Brow Bar* in Smith & Caughey's where I was left in the safe hands of Jess, one of Benefit's educators and brow experts. Jess started by asking what my brow requirements were. I have quite unruly brows so I like them to be shaped as naturally as possible with an arch rather than squared-off brows. That look works for Audrey Hepburn but I find it can look a bit harsh sometimes. Benefit Brow Experts then determine the starting point of your brow, the arch and then where the brow should end. This will be different for everybody and ensures you get the best shape possible. Then it is a case of tinting the brows (optional), waxing (again, optional but recommended) and tweezed to create the perfect shape. My skin is quite sensitive with brow waxing and the area underneath my brows never fails to go tomato red. Jess powdered under my brows with the Hello Flawless powder in Ivory (Gee I'm Swell), brushed them into shape with a spooly and I was good to go. I was really impressed by the Benefit Brow Bar service. Jess created the perfect brow shape for me and took care of all my brow needs. Brow treatments range from $29-$39 and Benefit recommend you rebook every three weeks. Head to the Benefit counter now to make a booking or phone 09 916 0895. You won't regret it. 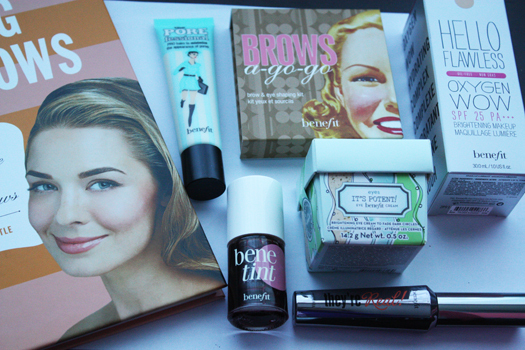 Benefit also spoilt us with all things brow related and some beauty treats too! Thanks Benefit xo.